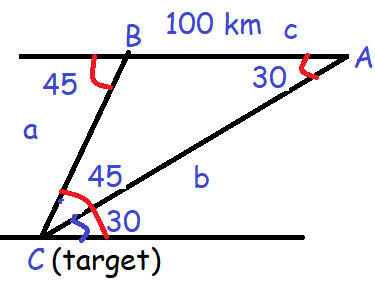 About "Law of Sines and Cosines Word Problems"
A farmer wants to purchase a triangular shaped land with sides 120 feet and 60 feet and the angle included between these two sides is 60◦. If the land costs Rs. 500 per sq.ft, find the amount he needed to purchase the land. Also find the perimeter of the land. To find the missing side, let us use cosine formula. The angle included by the sides a and b will be C.
A fighter jet has to hit a small target by flying a horizontal distance. When the target is sighted, the pilot measures the angle of depression to be 30◦. If after 100 km, the target has an angle of depression of 45◦, how far is the target from the fighter jet at that instant? From the diagram, we come to know that we have to find the value of a. After having gone through the stuff given above, we hope that the students would have understood, "Law of Sines and Cosines Word Problems"
Apart from the stuff given in "Law of Sines and Cosines Word Problems", if you need any other stuff in math, please use our google custom search here.